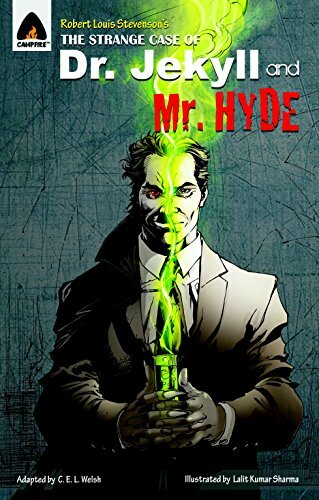 Bold visionary, Henry Jekyll, believes he can use his scientific knowledge to divide a person into two beings--one of pure good and one of pure evil. Working tirelessly in his secret laboratory, concocting a potion that would tear at the core of what makes a man human, he eventually succeeds--but only halfway. "It is good to see that C. E. L. Welsh's adaptation of the story for the Campfire Graphic Classic Novel series does nothing to dumb down the book and its themes. It follows the well-known story of the good doctor who discovers a drug that to his horror unleashed the evil beast inside him, and who is unable to control his other self closely and sets up the moral questions the story raises with some clarity. ... This is a dark story and that darkness is emphasized in the illustrations of Lalit Kumar Sharma." Robert Louis Stevenson was born in Edinburgh, Scotland, in 1850. Stevenson's most famous work is the classic pirate tale Treasure Island, which was published in 1883. Stevenson later created an infamous, but very intriguing, character in The Strange Case of Dr Jekyll and Mr Hyde, published in 1886. In 1887, Stevenson headed for America. It was soon after this move that he took up his pen for The Master of Ballantrae, a novel which is considered one of his best works. Stevenson died in 1894. While best known for writing tales of action and adventure, he is also remembered as an accomplished poet and essayist.